First, you will need to make up your blue and red cake. As I stated above I used a blue raspberry flavored cake and added a darker blue food dye to make it stand out more and a pink lemonade that I darkened with red food dye. I use the Wilton Color right in my foods and my crafts because the colors work the best! You can buy natural dyes if you prefer or other flavored cakes. Once the two batters were ready, I used spoons to drop in the different colors in a mixed up pattern...think tie dye. Bake this cake according to instructions on box. While your red and blue cake is baking, make up your white batter. Once your red/blue cake is done, cool completely. Cut your cake in half so its about an inch on each layer and easy to cut a small star cookie cutter into. Cut out small stars. Your star should be about 1 inch thick depending on the size of your cupcake pan. 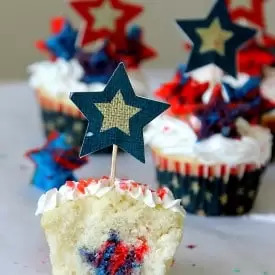 Add star standing up inside your cupcake. You can stack more than one star back to back if need be. Pour white batter around star taking care that your stars stay standing. Cook according to box. Take out and cool completely.